In a medium saucepan, combine milk and cream. Scrape seeds form vanilla bean into milk mixture; add bean mixture. Cook over medium low heat until mixture is very warm, about 10 minutes. Remove and discard vanilla bean. In a medium bowl, whisk together sugar and flour. Add egg yolks, whisking until combined. Whisking constantly. Pour one fourth of hot milk mixture into sugar mixture. Whisking constantly, add sugar mixture to remaining hot milk mixture. Cook, stirring frequently. Over medium low heat until mixture thickens and coasts the back of a spoon, about 15 minutes. Remove from heat; strain mixture into a medium bowl. Stir in corn syrup. Cover and chill for at least 4 hours or up to 3 days. In a medium bowl, combine chopped peaches and lemon juice. Let stand for 10 minutes. Add to chilled milk mixture. Pour mixture into the container of an electric ice cream freezer. Freeze according to manufacturer’s instructions. 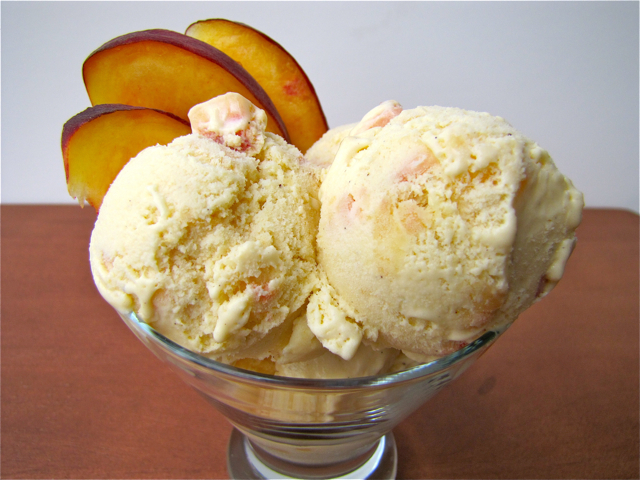 Garnish ice cream with peaches, if desired. End.